Fourth Ray Beauty Review — Beauty and Etc. 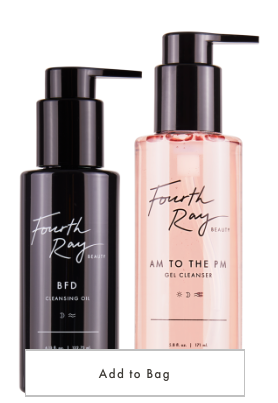 Have you ever heard of the brand Fourth Ray Beauty? Well if the answer is no, then you should continue reading to see which products I’ve tried and my thoughts on them. If you have heard of fourth ray beauty, you should still keep reading. lol. Fourth Ray Beauty is a sister company of ColourPop Cosmetics. All of their beauty products are listed under $20 and are made with clean ingredients. As per Fourth Ray Beauty, their definition of Clean Beauty is described as leaving out parabens, phthalates, SLS, gluten, synthetic fragrance and formaldehyde. All of the products are 100% cruelty-free, vegan ingredients. These attributes about Fourth Ray Beauty really intrigued me and made me want to try them out. I also noticed as I was browsing through their site the overall esthetic of the products are black, pink and white color scheme. I picked up the Take Me With You Travel Kit as a way to try out the main products from the line. I was also drawn to the kit for the cute travel bag. As I previously mentioned, this kit includes the cleansing duo (oil cleanser and gel cleanser), toner and moisturizer. The first thing I noticed is that all of the items are labeled with a ☼ sun or a moon to indicate whether the product should be used during the morning, evening or anytime during the day. This little touch of detail can be very helpful to those just starting out in their skincare journey! SUGGESTED USE: Apply directly to dry skin & massage thoroughly over face, then add water to emulsify product & continue to massage off makeup and debris. Rinse with warm water. Ingredients: Caprylic/Capric Triglyceride, Peg-20 Glyceryl Triisostearate, Helianthus Annuus (Sunflower) Seed Oil, Hydrogenated Polyisobutene, Carthamus Tinctorius (Safflower) Seed Oil, Camellia Oleifera Seed Oil, Juniperus Communis Berry Oil, Limnanthes Alba (Meadowfoam) Seed Oil, Vitis Vinifera (Grape) Seed Oil, Quartz. Review: This cleanser is indicated to be used during the Night hours to help remove makeup, sunscreen and dirt. Based on the other oil cleansers that I’ve tried in the past, I would consider the BFD cleansing to be more of a light weight oil. The smell is also very light and non-offensive. I really enjoyed using this cleansing oil. I found it very easy to remove my makeup and clean my skin. If you wear a lot of mascara like myself, you may want to remove it with a micellar water. The oil cleanser will remove heavy mascara, but it make take a little longer. Ingredients: Water, Sodium Lauroyl Methyl Isethionate, Glycerin, Polysorbate 20, Decyl Glucoside, Cocamidopropyl Hydroxysultaine, Cocamidopropyl Betaine, Disodium Laureth Sulfosuccinate, Litchi Chinensis Fruit Extract, Hedychium Coronarium Root Extract, Lotus Corniculatus Flower Extract, Hydrolyzed Jojoba Protein, Quartz, Rose Extract, Camellia Sinensis Leaf Extract, Lavandula Angustifolia (Lanvender) Flower/Leaf/Stem Extract, Cupressus Sempervirens Leaf/Stem Extract, Jasminum Officinale (Jasmine) Flower/Leaf Extract, Citrus Aurantium Bergamia (Bergamot) Fruit Extract, Citrus Aurantium Amara (Bitter Orange) Flower Extract, Mangifera Indica (Mango) Flower Extract, Prunus Amygdalus Dulcis (Sweet Almond) Seed Extract, Rosmarinus Officinalis (Rosemary) Leaf Extract, Salvia Officinalis (Sage) Leaf Extract, Pyrus Malus (Apple) Fruit Extract, Cucumis Sativus (Cucumber) Fruit Extract, Cucumis Melo (Melon) Fruit Extract, Cananga Odorata Flower Extract, Coffea Arabica (Coffee) Leaf/Seed Extract, Cucumis Melo Cantalupensis Fruit Extract, Sodium Chloride, Panthenol, Caprylic/Capric Triglyceride, Cocamide Mipa, Disodium Laureth Sulfosuccinate, Disodium Lauryl Sulfosuccinate, Hydroxypropyl Guar Hydroxypropyltrimoniuim Chloride, Trisodium Edta, Potassium Sorbate, Caprylyl Glycol, Hexylene Glycol, Phenoxyethanol, Yellow 5 (CI 19140), Red 4 (CI 14700), Ext. Violet 2 (CI 60730). Review: This cleanser can be used during the morning or evening. My initial thought of the product is that it smells very clean -like cucumbers. I usually use this cleanser with my Foreo Cleansing device. A little of this cleanser goes a very long way. I’ve used it so many times and my mini bottle looks like I barely touched it! I also enjoy using the AM to PM Gel Cleanser. After using it I don’t find that it makes my face feels dry. SUGGESTED USE: Saturate a cotton pad, swipe onto clean skin over the face and neck, day & night, avoiding the eye area. Review: I’ll be completely honest. I do not like this toner. This toner is suggested to be used during the morning and evening. I found it too strong to be used twice a day or even once a day. For me this would be something I would use maybe a couple of times a week. As I look at the ingredients, I think I dislike the toner due to high amounts of Witch Hazel and Alcohol that it contains. I also really dislike the scent as it smells very strong -almost like household cleaning ingredients. I would not purchase this is in a full size. Ingredients: Water, Hamamelis Virginiana (Witch Hazel) Water, Butylene Glycol, Glycerin, Alcohol, Polysorbate 20, Panax Ginseng Root Extract, Salix Nigra (Willow) Bark Extract, Lactobacillus/Papaya Fruit Ferment Extract, Quartz, Citrus Limon (Lemon) Fruit Extract, Citrus Aurantium Dulcis (Orange) Fruit Extract, Melaleuca Alternifolia (Tea Tree) Leaf Oil, Eucalyptus Globulus Leaf Oil, Camellia Sinensis Leaf Extract, Saccharum Officinarum (Sugar Cane) Extract, Acer Saccharum (Sugar Maple) Extract, Helianthus Annuus (Sunflower) Seed Oil, Vaccinium Myrtillus Fruit Extract, Jania Rubens Extract, Allantoin, Sodium Carrageenan, Gluconolactone, Citric Acid, Tartaric Acid, Sodium Benzoate, Phenoxyethanol. SUGGESTED USE: Massage onto clean skin using upward strokes. Layer on as much as your skin needs. Perfect for day time. Ingredients: Water, Squalane, Polysorbate 20, Glycerin, Propylene Glycol, Isopropyl Myristate, Quartz, Sodium Carbomer, Potassium Sorbate, Caprylyl Glycol, Ethylhexylglycerin, Hexylene Glycol, Phenoxyethanol. Review: The suggested usage of the Lightweight Hydrator is for the morning. This moisturizer is extremely light. I have normal to oily skin. I think this is a moisturizer that I would prefer to use during the summer humid months or before a workout. Those who have skin textures that are dry and normal may not find this hydrating enough. In the case, an oil could also be added to moisturizer for extra hydration. Being that I sampled this during the winter months, I didn’t find it hydrating enough for this time of the year. However, I will be holding on this travel size to use before the gym and to try out in the summer. Product Description: A set of 3 washable, reusable cleansing cloths - the perfect addition to any cleansing routine. These cleansing cloths gently exfoliate away dirt, makeup, and impurities leaving skin soft and ready to absorb the good stuff in your skin care products. I think these are okay. I was expecting the cloths to be of a thicker material. The cloths are also not very soft. As per the directions they do indicate that these cloths are great for exfoliation purposes. I use these cleansing cloths to remove facial masks and they work fine. I do think a few slight adjustments would make them better. I do wish they were made a little softer and perhaps in black. A set of 3 black satin scrunchies to keep your hair out of the way during your skincare routine - a kink-free, cute accessory! I’ve been on the hunt for satin scrunchies for some time. The majority of the ones I’ve found have been really expensive. $6 for a set of 3 was a pretty good bargain. I use these scrunchies to hold my hair up at night. The satin helps not to dry out my curls and doesn’t snag at my hair. I love these scrunchies! I’m thinking of picking these up in the pink set as well! I really enjoyed this cleansing duo. After depleting my current stash I fully intend on purchasing the full size. The COME CLEAN CLEANSING DUO SALE PRICE: $22.00 VALUED AT: (VALUED AT $26.00). The Mellow Mist is described as a calming mist that is made with White Tea, Calendula, and Marshmallow Root Extract. Chamomile and Oat Milk. I love hydrating mists. Described to be rich in antioxidants, Vitamin A, and Vitamin E, Watermelon Seed Oil combats free radical damage, balances sebum production, and provides detoxifying properties. This oils appeals to me as it sounds great for anti-aging and for oily skin. I presume this would be a great oil for the summer! Have you tried anything from Fourth Ray Beauty? Are you interested in trying out any products? If so, please comment below! Also if there’s a clean skincare beauty company that’s affordable that you would like to recommend, please comment below. Facial Essences: What Are Face Essences and How To Use Them?